In case you haven’t seen one of these before, or in case you’ve forgotten, PIE stands for Proto-IndoEuropean. IndoEuropean is the language that, because of migrations and thousands of years, became many of the modern languages of Europe and the Indian subcontinent. These languages include Greek, Latin, all the Germanic languages (including English), all the Romance languages, and Sanskrit, among many others. When we talk about a particular root word, we use the prefix “Proto” to indicate that the form has been reconstructed from the available evidence, taking words from various languages and working backwards. We do not have any direct evidence—no written documents—of IndoEuropean. On this date in 1908, Philadelphia Athletics manager Connie Mack sold his left-handed pitcher Rube Waddell to the St. Louis Browns for $5,000 ($138,480.55 in 2017 dollars). Who was Rube Waddell? Baseball has been famous through the years for characters, people who were clearly marching to the beat of a different drummer. Waddell marched to the beat of a drummer no one else could see or hear. In a sport where left-handed pitchers are notorious for being especially strange, Waddell was a stand out. His eccentricity also made him somewhat unreliable. For instance, he had a fascination with fire trucks, and he would follow after them if they happened to go by wherever he was. Even if it was in the middle of a game. It’s said of him that he would sometimes leave in the middle of a game because he just decided to go fishing. One of the little tricks Waddell liked to play was to invite the 7 fielders to come and stand on the sidelines to watch him strike out the side; this was technically illegal in professional baseball, so he once had all the field players come and sit on the infield grass to watch. Early in his career, while he was pitching for Connie Mack and the Milwaukee Brewers (an American League before the American League was on the same level as the National League), he pitched all 17 innings of the first half of a double header, winning the game with a game-winning triple . Then Mack offered him a 3-day fishing vacation if he would step up and pitch the second game. He threw a complete-game shutout and went fishing. Rube Waddell was a strike-out pitcher before the age of strike out pitchers. In 1902, he struck out 302 batters (the Athletics finished 83-53 that year—notice that they played only 136 games, not the 162 games that contemporary baseball teams play). His total that year was 115 more than his closest competitor. The next year he struck out 349, 110 more than the runner up. The next time a major-league pitcher would strike out over 300 batters in consecutive seasons would be 1965-66, when Sandy Koufax pulled it off. And if you’re a baseball follower, you’ll find this interesting: in the era when Waddell pitched, most batters slapped at the ball, just trying to get on base. In 1919, Babe Ruth led the American League with 29 homers. In the 18 years before that, the biggest total for any home run leader was 16 (Socks Seybold, Philadelphia Athletics, 1902). From 1911 through 1914, the Athletics’ star Frank Baker (nicknamed Home Run Baker) led the American League with 11, 10, 12, and 9. It’s much harder to strike out slap hitters than it is to strike out guys who are swinging for the fences. So why did Connie Mack sell this outstanding athlete? Well, apparently Waddell wasn’t good at following the team rules. He may have had a personality disorder or a learning disability; he was most certainly an alcoholic; he lived life on his own terms no matter what the cost. In 1902, Mack let Waddell try out for the Athletics’ football team, but when Waddell broke the quarterback’s leg in practice, the Athletics’ owners realized that football could be risky, so they wouldn’t let their star pitcher play. He moved home to spend the off-season in his home in western Pennsylvania, where he played semi-pro football. In addition, he played keeper for a team in the St. Louis soccer league. In addition, he toured the country in a play called The Stain of Guilt, a melodrama, in which he played himself. He was not only an incredible athlete but also a real showman. Many people, particularly after his death in 1914 at the age of 37, credited with Waddell with saving the American League when the league was facing bankruptcy. He was the Michael Jordan of his day—people in cities he visited filled the ballpark just to see him pitch. He may have been baseball’s first superstar celebrity. But sadly, he ruined his own life through drink and dangerous behaviors. He is described as a man with the maturity of a child. Waddell was elected to the Baseball Hall of Fame in 1946 by the Veterans Committee. He finished has major league career with a 193-143 record, over 2300 strike outs in 13 seasons, 261 complete games, and a 2.16 lifetime ERA. But whether he was a comic or tragic hero,, he had the temerity to live life the way he wanted to. 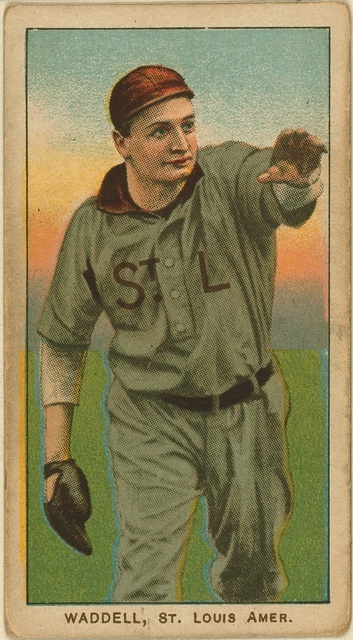 The image is of the Rube Waddell baseball card, issued in 1909 by the American Tobacco Company.